Many people enter into the spirit of summer when they finally hear the ecstatic bursts of song from the Eastern Goldfinch. This lively bird, also known as the wild Canary or Yellowbird, sails through the air on an ocean of joy. In summer, when the thistles reach full bloom, mating season begins. The thistledown is used by mated pairs for nest building, and the plant also provides a favorite food as its seeds are usually ripe when the young Goldfinch needs them most. 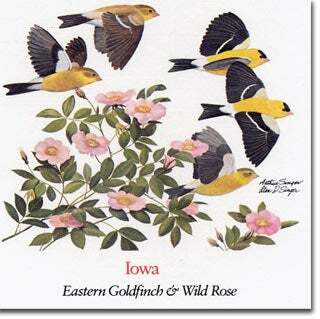 The Wild Rose of Iowa has five petals, which close protectively over the many stamens on rainy days and at night. Roses have no nectar, but they have pollen which attracts many insects. 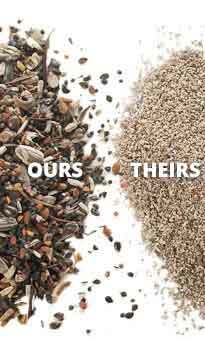 After the petals fall, the green seed receptacles, each with a crown of five sepals, swell and grow. In the winter the bright red color of these berries, or hips, is most noticeable. Practical uses of Roses, besides their importance as a source of perfume, include a delicate-flavored and delicious jelly made from the Rose hips of some Wild Rose species. 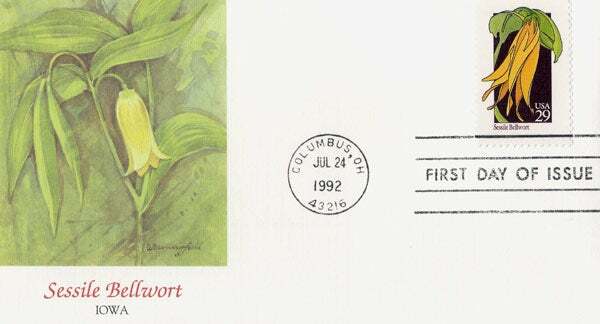 Iowa Wildflower - Sessile Bellwort Art from the 50-stamp series, State Birds and Flowers, issued April 14, 1982 simultaneously in all state capitals.